Intacs, or intracorneal ring segments (ICRS), is a non-laser treatment for mild nearsightedness. 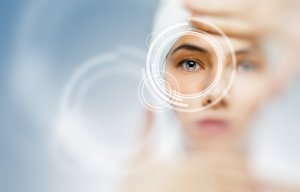 It can also be used to treat the astigmatism and nearsightedness that occurs with keratoconus, one type of corneal disorder. Intacs is a pair of crescent-shaped plastic devices that are implanted in the eye. During the procedure, an eye surgeon makes a small incision in the cornea and then inserts the ring segments in the eye. The segments are placed at the outer edge of the eye, which leaves the center area free. This device is left in place, and the cornea is allowed to heal. The ring segments work by flattening the cornea. 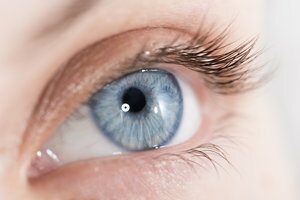 This changes the direction of the light rays entering the eyes so that they land in the correct location on the retina. The result is more focused vision. Intacs can also be used along with glasses or contact lenses to provide better vision. Once in place, the Intacs segments do not need any further adjustment. They can also be removed and new ones can be implanted. This procedure may also enable people with keratoconus to delay having a corneal transplant. People may experience up to four days of discomfort or pain after the ring segments are implanted. In addition, the vision may fluctuate for several weeks or months after the procedure. In some cases, Intacs may not improve the vision. Conductive keratoplasty (CK) is sometimes combined with Intacs for keratoconus patients. CK shrinks collagen, helping to reshape the cornea. It may be done at the same time as Intacs surgery or after the sutures are removed. CK is not approved by the FDA for treating keratoconus, but some eye doctors use it as an off-label approach. To learn more about Intacs treatment or other treatment options for corneal or refractive problems, contact our office today.